This Kindle blog of Kindle Fire, Paperwhite, and other e-Ink Kindle tips and Kindle news - with links to Free Kindle Books (contemporary also) - explores the less-known capabilities of the Amazon Kindle readers and tablets. 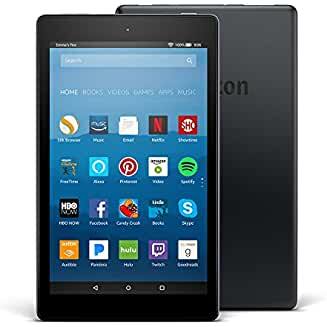 Ongoing tutorials, guides for little-known features and latest information on the Kindle Fire tablets and their competitors. Questions are welcome in Comments area. There are tons of specials everyday as most of you know, and you'll always see the various types linked on the Reference column at the right of this blog. But this particular Kindle book sale caught my eye. One book focuses on how to best cut various vegetables, others give tips on how to get best results with instant pots and pressure cookers (I have neither yet). Since these are normally priced quite a bit higher and I need a lot of help :-), I already ordered some (I'm useless in the kitchen, so this is a start) and thought that as little as I blog lately, I'd add the special alert for others. There are about 71 books on this sale, with 20 shown on each full page. Most appear to be more-highly customer-rated titles. So, if these interested me, they'll probably be of interest to people who actually spend time in the kitchen. Each selection has a "Look Inside" feature, so you can see whether the layout and content is really of interest to you. *Click* to Return to the HOME PAGE. Or click on the web browser's BACK button. Below are ways to Share this post if you'd like others to see it. -- The Send to Kindle button works well only on Firefox currently. Questions & feedback are welcome in the Comment areas (tho' spam is deleted). Thanks! Amazon just announced a "limited time" discount of $30 off select Kindle E-readers. You'll see which ones in the Comparison chart image above. If you click on the image, it'll take you to Amazon's full Comparison Chart of features for each E-reader, or you can click here for that. The basic Kindle, normally $80, is $50 for or however long they run this. That's probably the lowest price I've seen on that model. It has Amazon's Audible capability (using Bluetooth, same method for the New Oasis) but does not have built-in lighting. It's the lightest one of this current set, weight-wise -- an important factor for many. Its display resolution is 167ppi vs the 300ppi of the other Kindles. The text would be a little less bold than on the other Kindles. The Paperwhite's current sale price is just $10 more than the regular price of the basic Kindle but has built-in lighting and the higher-definition display, although it has no Audible capability. Will get this quick blog entry off, so blog readers will be aware of the temporary $30 discount and have enough time to read the comparisons and all of the Amazon page details to see which features might be more or less important for you. UPDATE: Amazon has added a Kindle 10th Anniversary Deals page and appears to still be adding to it. Included are better trade-in terms than usual, though not startling. But they're featuring a possible $75 toward a new Paperwhite when trading in an older Kindle E-reader (another "limited time" offer), depending on the condition of your used Kindle and the way in which you prefer to receive $credits. For other info (general), you can visit the blog anytime at A Kindle World on the web. That info or link is for those who still choose to have the last 25 blog entries delivered to their Kindle readers via the blog edition for Kindle E-readers (US). This is a 14-day free trial and 99c per month if it's wanted. Amazon's "All New Oasis" (UK, Canada) was announced today. 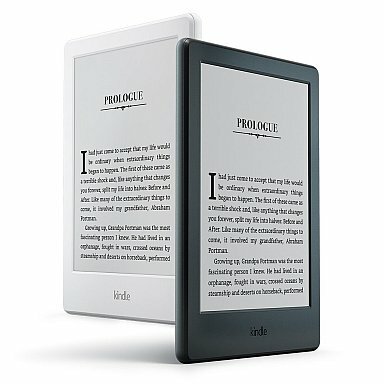 New features: First waterproofed Kindle (IPX8 rating); twice the amount of basic storage as the other Kindles and you can choose 32 GB if you need it (for an additional $30) "to hold more magazines, comics, newspapers, and audiobooks"; dedicated page-turn buttons on an ultra-thin 3.4mm 7" display that shows 30% more text; and, as before, adjustable front-lighting that's said to be twice as effective as the ones in other Kindle models. How effective is the water proofing? Amazon explains that it's "rated to protect against immersion in up to two meters of fresh water for up to 60 minutes. And it's built to withstand getting splashed at the beach or dropped in the bathtub, hot tub, or pool." They give more details on what to do if it gets wet; what steps to take to dry it; and how to reduce the likelihood of water damage." A waterproof Kindle has been a long-requested feature, so it's likely to generate a lot of interest. As with the basic Kindle model for 2017, this one comes with Audible for those who prefer to listen to their books when that's more convenient. Note that the Oasis has 12 LEDs (said to give more contrast and darker letters) + adaptive light sensor, while the others have either 0, 4, or 6 LEDs. The Kindle Voyage has the "page press" feature (less definite action), while the Oasis has actual page-turn buttons, a feature that many miss from the original Kindles (eons ago, it seems). The Paperwhite, Voyage and Oasis all have the option of free Cellular Connectivity for an additional $50 (with the Oasis), BUT when trying out the 'Customization' of purchase options, I cannot choose the cellular-connectivity capability without the package now being automatically 32 GB (rather than 8, even if not needed) and then $30 more, AND the process also selects "without special offers" (ads on the lock screen) -- an option that is valued at $20. These all add up to the $100 difference, instead of just $50 for the cellular option. My guess: they probably prefer not downloading graphics-heavy ads over cellular-networks as data that Amazon would be paying for, so they are foregoing the 'special offers' in this case by automatically charging the $20 to not see them, and it all gets rolled into the $100 additional cost to be able to download data while at the beach or on the bus, etc -- unless the customization limits are in error, but I don't think they are. ALSO NOTE: The official Amazon 5W USB Power Adapter is NOT included with even this premium E-reader. It's been a policy for some time to not include the power adapter, since many already have them for other or earlier Amazon E-readers or Kindle Fire tablets, and so Amazon includes only the USB cable that connects to a power adapter. Therefore, the cost when you want to add that adapter is another $20 (UK, £17). I still read on a Paperwhite3 (and still love the old thing). Since I don't read around water, although I know many do, I'm not likely to upgrade, even if reviews of the first Oasis found it easier to hold and a pleasure to use. I also don't send for review copies, as I don't have the time these days, but I'll watch the reviews and forum discussions and bring back any interesting info I find. While this new Oasis is "Available" for pre-order now, I've not yet seen an official delivery date, BUT on a listing I saw that includes "not-for-retail" (yet) models, the date given is October 31. That includes an int'l page designated "not for retail" so I'll give the link to that when it is ready. Will update this blog as I get more info. Be sure to read the linked-Oasis page for details on the new software - enhanced layout and formatting features. If you have questions on any of this, let me know in Comments section, and I'll try to find answers for you. Amazon is releasing October 11, 2017 the All-New Fire HD 10" tablet, with higher resolution, speed, and Alexa voice control. Also, many are not aware that the latest Fire tablet models (FIRE OS 5+) can be set up to use Google Play Store. I'll do a separate article on that soon. No rooting or system modifications are involved. I've found that the earlier, simple instructions to add Google Play Store and Services to Fire tablets with Fire OS 5 and above, now require somewhat different Google files, depending on which generation Fire tablet you have or will have soon. There are also situations in which older files work better now for many, but some of the Google Play files will auto-update with time. There are workarounds for various minor problems encountered by some, and I'll explain these, although maybe not until after a deadline I have for mid-October. I've updated the general reference chart of current available Kindle eReaders and tablets internationally. Of interest, maybe: Amazon is still showing the 2016 Fire HD 6" tablet available in the 16 GB version, adding "Only 1 left in stock (more on the way)" and citing Oct 3 as a possible delivery day for the one still in stock. I've seen unhappiness that this pocketable and light, book-sized tablet might be ended, so this could be good news (or just a mistake). and 2) their tablet comparison page for all 5 editions. All New Fire 10 The "Essentials Bundle" saves $15. 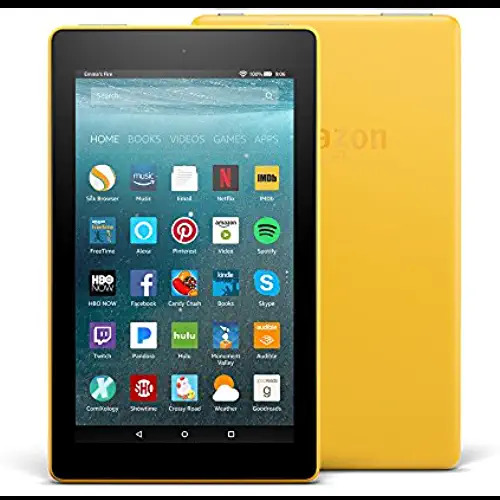 This new 10" Fire tablet has 1080p full HD display (1920 x 1900), a fast quad-core processor, doubled memory (2 GB RAM), 32 or 64 GB internal storage plus up to 256 GB expandable storage via a microSD card slot, up to 10 hours mixed-use battery life, and more tested durability than the iPad Pro 10.5" at considerably lower cost. The cameras are modest, keeping that cost down, while it offers FLING (to TV) technology. The bundled option adds the Amazon cover and screen protector at $15 less than if bought separately. 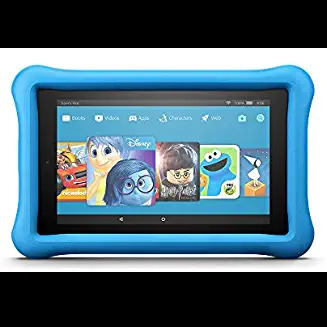 This is the first Fire tablet with the Alexa Hands-free voice feature. "... pause videos, play music, open apps, show sports scores, display the weather, and more — just ask (available soon via software update)"
Thinner and lighter, improved 7" IPS display, battery life now up to 8 hrs, faster performance, improved Wi-Fi connectivity. 8 GB or 16 GB. Up to 256 GB expandable storage via microSD card. Over 1 million pixels, widescreen 8" 1280 x 800 HD display, up to 12 hrs of battery life, and 16 GB of storage. Up to 256 GB expandable storage via microSD card. All New Fire 7 Kids Ed. As above, but with 16 GB of storage and with a year of Amazon FreeTime Unlimited* (see article explaining benefits, a kid-proof case, and a 2-yr worry-free guarantee. * Amazon FreeTime Unlimited, Amazon adds, "now offers over 15,000 age-appropriate books, videos, educational apps, and games, plus access to over 55,000 hand-curated websites and YouTube videos, plus Parent Dashboard and Discussion Cards." Alexa - Just press and ask to play videos, enjoy music, listen to audiobooks, ask questions, shop, find news, display the weather, and more on your Fire tablet. The new Fire HD 10" tablet being released October 11, 2017 has "Hands-Free feature -- no need to press a button, instead, "just ask" (I assume you preface the Alexa requests with the word "Alexa" (to wake up that feature) as is done on the original Amazon Echo. Quad-core 1.3 GHz processor - Quickly and easily switch between apps, stream movies, and browse the web without waiting for your tablet to catch up. Durability - As measured in tumble tests, Fire 7 and Fire HD 8 are both more durable than the latest generation iPad. Front- and rear-facing cameras - Video chat with friends and family with the front-facing camera; take and share photos, and save them for later with free, unlimited cloud storage for all photos taken on Fire devices. Fast Wi-Fi connectivity - dual-band Wi-Fi with support. Screen Sharing customer service - let an Amazon expert guide you remotely through any feature on your screen, available 24x7, 365 days a year - for free. Amazon-exclusive features - Alexa, ASAP, X-Ray, Second Screen, Amazon FreeTime, Family Library, Blue Shade, On Deck, Prime Video downloads, and more. World-class content ecosystem - Access to millions of movies, TV shows, songs, books, magazines, apps, and games - with free, unlimited cloud storage for all Amazon content. New color options - Black, Punch Red, Marine Blue, and Canary Yellow. Thinner and lighter, improved 7" IPS display, battery life no up to 8 hrs, faster performance, improved Wi-Fi connectivity. 8 GB or 16 GB. Up to 256 GB expandable storage via microSD card. The tablets are available in a multi-pack option ... Buy any three Fire tablets and save 20 percent. For now -- For those in the UK, you'll see the same new tablets HERE. Canadian and International Fire tablets are probably ordered from the U.S. pages above these days. Alexa - Just press and ask to play videos, enjoy music, listen to audiobooks, ask questions, shop, find news, display the weather, and more on your Fire tablet. I'll update the special Kindle eReader and Fire Tablets sheet or table probably this weekend. Beam n Read reading and general travel light - Reprise for those who don't know about the around-the-neck light. Updated 4/17/17, 11:00 pm for current models + the new BnR USB Power Kit. BEAM N READ 3-Led light, made by ASF Lightware Solutions. As regular readers will remember, my personal favorite in reading lights (I've bought too many different types) has been the Beam N Read "LED 3 Hands Free Travel Reading Light; for Kindle, Power Outages & More" that I first wrote about in early October 2010. I'm still using the 3-led light version nightly, as it does well enough so that I almost never need the 6-led light one. I definitely use it when walking outside at night. I'm including much of what I wrote at the time. Note updating information: The company saw my blog article and wrote to add updated information on both lights. The 6-LED-light link to the older model still works and, if used, the newer model is sent, along with their BNR CL1M magnifier kit which contains one lens, but the new 6-LED model ordered direct at the revised link is sent along with the two filters and delivered using PRIME shipping. As before, I'm including a couple of photos below to show light coverage on my older non-lit Kindle with its Amazon cover, with built-in light (no longer available) vs. using what became my favorite light for the various Kindles I have. This portable light is worn around the neck and has an adjustable strap. The 3-LED light model is now said to last about 100 hours (based on the ANSI/NEMA FL-1 Standard: continuous runtime on high to 10% of initial brightness), and I do use it nightly for weeks before needing to change batteries. Normal intermittent use (I can't imagine anyone running a light like this for 2 to 4 days straight) will result in actual runtime over 120 hours shining 3 LEDs, they've found. The 3-LED model no longer comes with batteries but ships with two blue-light blocking filters (orange and red, softening the light, helpful for partners at night too). The company added the orange filter because many use the light to read or stitch late in the evening. Removing the batteries eliminated the occasional problem of battery leakage in the box and helped keep a lower retail price despite increases in manufacturing cost. Because it's very lightweight and flexible with a patented flip-up design, reflector, and the adjustable strap, I usually have it on when I'm home. Going downstairs at night or to a less well-lit room, or when I just can't see something well enough, I can just turn this on briefly, which is done by flipping up the hood/reflector. I also use it to read fine print. For reading a book or an e-book reader, you can also reverse its positioning if you prefer (as I do) to hold the book higher than on your lap, and then flip the reflector down instead, so that the light angles up. But if someone is sitting across from you, that may not be very comfortable for that person, as the Led lamps would be directed at their eyes too. Their newest 6-LED version is VERY bright and probably overkill for reading a Kindle 6" reader, though I've sometimes used it for situations where the light is just dim. I tried one for other uses, and for my Kindle DX in Landscape mode. The batteries for this last, they say, about 50 hours, vs the 100 to 120 hours of the 3-LED model. This 6-LED model never came with batteries included although it has a magnifier for short-session, detailed craft work. I personally found the magnifer texture quite hard to see through and it's not a feature I'd use. I DO use both Beam N Read units for piano music though, depending on how well the room is lit. I had bought a head lamp for a trip I took in October 2011, since we needed to go into some unlit places (Egyptian tombs! ), but I don't at all like wearing something around my head just to read so I wondered if there was anything like this. Amazon doesn't make this easy to find, but I've found it extremely useful for any e-reader. And when out at night I'm often asked what that is that I'm wearing. Having slipped in the rain recently on a rain-filled metal cover I stepped onto, I'm even more apt to use this when I'm out and the lighting is bad. Here are photos of the effect of two reading lights on my Kindles. Lit by the now-discontinued Amazon cover with built-in light, the upper right hand corner of my Kindle 3 (UK: K3) ("Kindle Keyboard") is brighter than the lower-left area, of course, and the light isn't as bright as I like but it's useful if you're out and need a light for reading. That special cover light needed no batteries, as it ran off the Kindle's own battery, and it did shut off automatically if the Kindle went into sleep mode after about 10 minutes. The second picture is of the same Kindle lit by the Beam N Read 3-LED light -- the lighting on my Kindle 3, in this case (no flash was used, as you can tell from a click of the image that leads to the EXIF camera data included with the larger image at PBase) is very even and brighter overall than from the one built into the Amazon cover, but one would seldom wear the Beam N Read when out, probably, though I've definitely done it :-). Again, I hope this helps some who are looking for good lights to use with the Kindle. I did the various photos, as choice of a light has been one of the most asked questions on the Kindle forums. Here are reviews and user feedback cited as well as a page on "Uses" of this unique light, at the company's website, collected from several types of communities, including gadget and e-reader blog sites. At the Amazon product page, the light, though not promoted by Amazon as a Kindle light, has customer reviews with a high average rating. I do use this light daily, as I don't have to worry anymore about which light fits which Kindle model and because I use it for other purposes as well, as mentioned. Remember that I like to reverse the way it's worn when I'm reading in sitting position as I prefer to hold the Kindle higher than some do. This power kit allows plugging into USB for external power. From the company: "The kit includes a 6 foot Beam n Read-to-USB cable plus a 6 foot USB Extension cable enabling one to plug in up to 12 feet away from the power source. The cables can be plugged into the included USB/AC adapter or into a USB hub, USB car adapter, the USB port on a computer, the USB socket on your airline seat, and other devices" - USB adapter/chargers, etc. 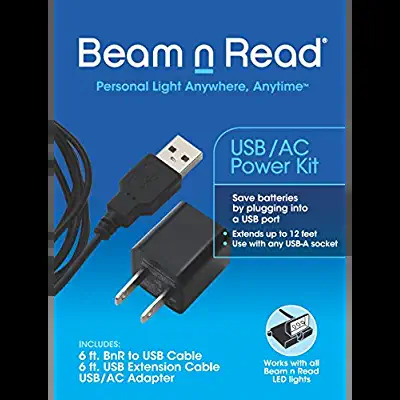 So, Beam n Read is a portable, personal light that delivers extra long battery runtime and, now, the ability to use external power via USB. As the company points out, most lights can’t plug in; some can be plugged in for recharging but have relatively short runtimes; a few can be plugged in for external power but those also have relatively short battery runtimes. And while most older models of other brand lights can’t use USB, older model Beam n Read lights CAN use the USB Power Kit. I'm going to try one out. While I receive many offers of products for review, I don't do actual reviews, writing only about products I've bought and really enjoy. In this case, I've bought some for friends, and friends have bought them as well. It's just an unusual, generally very-useful product. Today only -- Over 40 Goodreads Choice Award winners and finalists at up to 80% off on Kindle. Dec 27 only. Updated with corrected link + books I chose. Just a quick flash since there is a one-day deal on some 'choice' Kindle books that may be of more interest than the usual. I haven't been active on the blog, but when I saw this, I thought this was a good change from the usual. At the last-minute-deals page for today only, December 27, 2016, Amazon is offering over 40 Goodreads Choice Award winners and finalists at up to 80% off on Kindle. When on that last-minute deals page, click on the image you see here (today only though), to browse what's available. I don't buy books as often as I used to, being so behind in reading, but this was definitely one of the better one-day Kindle deals. UPDATES: I've updated the table of current Kindle device ID and links for the U.S., UK., Canada and International offerings. (Nov 24, 2016). In September, Amazon released the newer 8" Fire HD tablet. Clicking on the image or the text link will get you the info on what this one does. I haven't had a chance to look at forum responses to this model (I'm still happy with my older 8.9" HD year 2013 model), but the reviews rate this new HD 8"device higher than I've seen with previous tablets. I'll be looking at this more closely later. UPDATES added here Nov 28-29 for Amazon's CyberMonday Week (General, rather than just devices). So, these days, special sales holidays are week-long as they were last year (and probably the year before), but they have always run out of some items and their discount amounts may fluctuate. Amazon of course updated its Amazon Devices page for Cyber Monday's pricing. Most of the "Thanksgiving Holiday" pricing remains since that was to be for a week anyway. However, Amazon ended several device/tablet sales though they still have a couple of other ones. UPDATED AGAIN Nov. 29 to confirm that the Fire HD specials on Monday were in effect through CyberMonday only and NOT for the week. What's described just below is NO LONGER ON SALE for the rest of CyberMonday Week, unfortunately. So, I'm revising the wording for Tuesday morning. The default HD8 model has 16GB of memory. The tablet does come with a microSD slot for added storage, but I personally always feel more comfortable with the 32GB so I don't have to swap apps out or worry about how much music I can keep on the tablet or the number of movies downloaded. The difference is about $30 between a 16GB model and a 32GB version. With a fast processor and HD definition, it's a good deal, but more so when you have Amazon Prime-US or Amazon Prime-UK and its huge selection of free videos and free 2-day shipping among many other features -- and a 30-day free trial comes with the purchase, but after the 30-day period, Prime will cost about $8.25/mo on an annual basis, although Prime for STUDENTS - US or Prime for Students - UK is a much better deal. The Essential bundle came (and will likely be offered again, later) with only the black cover, but when buying the Fire tablet separately, you're offered a choice of blue, magenta, or tangerine colored covers -- however, this color choice in covers would cost more when the cover is added separately. On the HD 8 page (UK page here) for just the tablet, the colors represent the colors of a cover IF you choose to also get a cover. They had the bare bones Fire basic model for $33 Monday. It has Only 8GB memory with probably 4GB+ used by the system files. It does have a microSD slot -- but with only 8GB of internal memory, you'd be switching out material quite a bit, back and forth. Good for very young kids, probably. It's normally $50 and is back at that pricing Tuesday Nov. 29. HOWEVER, remember that the 8" HD model with better speed, display, and storage space is only $40 more. Also remember that Amazon is still adding sales items on the Amazon Devices CyberMonday page as well as the GENERAL CyberMonday Week page for other items. However, I get banners showing different sales pricing depending on the page I was on when I clicked to go to look at current Kindles. Black Friday Deals Week: Kindle $79.99 $49.99, Kindle Paperwhite $119.99 $99.99, and Kindle Voyage $199.99 $169.99. Limited-time offers: Kindle $99.99 $69.99, Kindle Paperwhite, $139.99 $119.99 and Kindle Voyage $219.99 $189.99. That's probably because Amazon is changing its landing pages and hasn't yet caught all of the Black Friday changes, which would officially begin tomorrow but they usually start them earlier. So, this is a heads-up that for the Black Friday Deals week, look for the first banner above, for eReaders. The "Learn more" leads to the Fire HD 8 page that has a banner that links you to the HD 8 Essentials Bundle at a very good discount for now. Getting this off for browsing during spare Thanksgiving Day time to be ready for Black Friday. Catching up: Latest Kindle + Free Entire Sunday NY Times Magazine edition on "Fractured Lands: How the Arab World Came Apart"
Wanted to explore some new features and updates but have to leave again and can't start that until tomorrow. I've finally updated the Kindle chart listing of what's available globally, with links to specific current models. In the meantime, here's an amazing resource today for those of us stymied by what has happened in the middle east and the ramifications globally -- a significant free offering by the New York Times today. FRACTURED LANDS: HOW THE ARAB WORLD CAME APART - an Interactive, online "book" in essence, which you can access and resume when you have time and interest. The NY Times is providing FREE, for all readers, even non-subscribers, today's ENTIRE issue of its interactive edition of its Sunday NY Times Magazine: "FRACTURED LANDS: HOW THE ARAB WORLD CAME APART." ' ... In print, it occupies an entire issue. The product of some 18 months of reporting, it tells the story of the catastrophe that has fractured the Arab world since the invasion of Iraq 13 years ago, leading to the rise of ISIS and the global refugee crisis. The geography of this catastrophe is broad and its causes are many, but its consequences — war and uncertainty throughout the world — are familiar to us all. Scott Anderson’s story gives the reader a visceral sense of how it all unfolded, through the eyes of six characters in Egypt, Libya, Syria, Iraq and Iraqi Kurdistan. 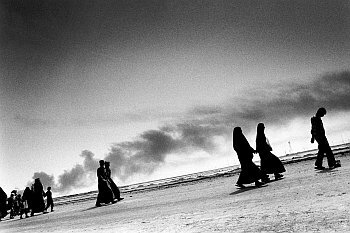 Accompanying Anderson’s text are 10 portfolios by the photographer Paolo Pellegrin, drawn from his extensive travels across the region over the last 14 years, as well as a landmark virtual-reality experience that embeds the viewer with the Iraqi fighting forces during the battle to retake Falluja. " The new KINDLE OASIS arrives and it's a luxury/premium model. What are the added features? Physical page-turn buttons, lightness, a cover that charges the Kindle - giving 'months' per charge, enhanced page consistency. (UK, Canada, Int'l also) UPDATED Apr 16-17 with added info. So, the new Kindle Oasis is almost here. For one thing, physical, dedicated page turn buttons are back ! The nicely-sized 'handgrip' side is wider and thicker, while the other side of the Oasis is slimmer. HOWEVER, when you want to hold it with the other hand, you can just turn it around and the Oasis will auto-rotate the page orientation to match. Amazon claims that "the tapered, ergonomic handgrip shifts the center of gravity to your palm, to rest in your hand like the spine of a book. Perfectly balanced for one-handed reading,"
It's now, overall, both thinner and lighter than previous Kindles. Almost an inch shorter, it's a bit wider to get a more secure handgrip, and when you measure the thinness against earlier models, the NON-page-turn buttons side is at least twice as thin, which is hard to believe. Oasis (UK: here, Canada: here, Int'l: here) comes with a removable leather charging cover included, which "boosts battery to last months." Color options are black, merlot, or walnut. I've read that without the battery cover, the battery life is shorter than on the earlier, larger Kindle e-Ink readers, but most use their Kindles with a protective cover and this will give battery life lasting "months" instead of "weeks" as with the earlier Kindles. The product page explains that you can "charge the Oasis and cover simultaneously while snapped together and plugged in. When on the go, the cover will automatically recharge the device ...Plus, a new hibernation mode minimizes power consumption when your Kindle is inactive, extending battery life to its fullest capacity. I haven't seen an Amazon-product option that isn't in leather (some don't want to buy animal skin) but I imagine 3rd party covers will be available, although I haven't seen if they'll be able to use Amazon's battery-charging technology. Amazon describes the cover as one that "fits closely around the bezel, waking Kindle Oasis when opened and putting it to sleep when closed. Twelve magnets form a secure attachment between device and cover, while still easy to detach when the lightest possible weight is desired." Without the cover, the Oasis weighs 4.6 oz. vs 6.3 oz. for Voyage and 7.2 oz. for the Paperwhite 3. Display resolution is the same for all three of these, at 300 dpi. The new Kindle doesn't have automatic light adjustments but it does have 10 LEDS vs 6 in the Voyage and 4 in the Paperwhite 3. Amazon explains that the 60% increase in lighting brings " enhanced page consistency" -- a feature that some Kindle users will appreciate when even the slightest variance has bothered some in earlier versions. Storage capacity is the same at 4 GB. They promise "Sharp, dark text" (which I hope they apply to the HOME page as well, since their latest update to the older Kindles lightened the font colors for the Home page and therefore reduced the contrast -- I'm still hoping they'll fix that). "All fonts have been hand-tuned at the pixel level for maximum readability." The CURRENT price showing as of today (prices can change from time to time) is $289.99, and if you want 3G cellular network capability in addition to the default WiFi, that's an additional $70 (or $359.00). As with all the other Kindles, the default configuration includes "Special Offers," which can be good offers or sometimes just ads on the lock screen. To get the Oasis or any Kindle with NO Special Offers on the lock screen, it's an additional $20. Here's a link to Amazon's COMPARISON CHART of Kindle e-Readers (UK: here, Canada: here, Int'l: here) as of April 14, 2016.
Who might find this premium model worth a look? While responding to a comment just now, it occurred to me that commuters who need to stand and hang onto a strap for long rides might find it easier to hold onto this Kindle with only one hand (no stretching the hand for screen taps to turn pages). It'd be less likely to cramp the hand. And Tom Semple mentioned earlier that people going away (camping etc) to places with no electricity will find it useful. Then there are the few who see uneven lighting even on the Voyage and post that they're very bothered by it (while others don't notice, so it's a matter of how your eyes see). That's it for now. Are the premium features attractive to you? I'll be back to update this as I find out more. Mashable's Lance Ulanoff offers interesting points, not mentioned on the product page, from his conversations with Amazon. • While the screen is only 3.4mm thick, the grip side with page-turn buttons houses the e-reader’s CPU, storage and battery. • The body is made of an electroplated polymer for added strength. • The Oasis appears sharper and brighter due, Amazon explained, to a wider white gamut and with "brand new" lighting and screen refraction. • "The lighting now flows in through the side and is spread evenly over the screen by something Amazon called a 'cylindrical refractive pattern.' What I noticed is that, even at its brightest, I could not see the actual LEDs. • Amazon explained that they chemically strengthened the glass after cutting it down to size rather than before. This helps prevent weak spots. • The page turns, for him, were quicker, without noticeable flashing. Ulanoff also describes how this cover works. See that and more at the full article. ALSO The best Kindle Oasis photos I've seen for a good idea of what the new model AND cover look like are at The Verge article by Nick Statt. ZDNet review + What's inside? Mighty Bright, Kindle version has an added foam pad, inside the upper clamp, to prevent scratching the Kindle bezel. Free trial: U.S., U.K. - Each has the last 20 articles. Usually 1 day/wk. 99 cents/mo. These features pertain to new Sept. 2014-2015 Fire Tablets as well. 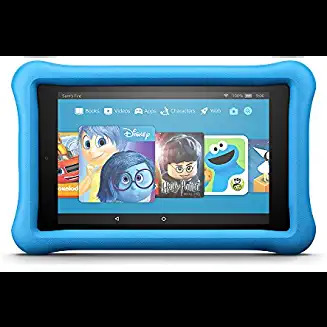 Tablet: Kindle Fire HD8 8"
For 99 cents/mo., or 3 cents/day, the full text of this blog's most recent 20 articles is delivered (w/ images) to your Kindle whenever there's a new entry or updated information. Each Kindle delivery replaces the previous one. No clutter. U.S./International (except UK) Edition: Click here for a 14-day free trial. It's easier to navigate than usual feeds, and you can read the latest 20 articles. UK-Only Kindle Edition: Offered Aug 2010, this is also a 14-day free trial.
. 3G or WiFi? Which one? See Kindle Fire HD 7" section below for features, as those will be the same.
. Add Wi-Drive pocketable disk/stream'g for 7" & 8.9"
or a Portable wireless 320G Patriot Gauntlet drv/stream'g for 7" & 8.9"
. Kindle Fire "on fire"
. KTouch 3G-Web'g or not? Besides new books, we can enjoy Classics for free, both from Amazon and from other book sites, many directly downloadable to the Kindle. The ongoing Free-Books page, in detail, with prepared searches. Just a few mentioned below. Kindlefeeder feeds your Kindle well. No fees required except for auto-scheduled pickups. You can press Send at the website instead. Amazon fees affect some options. Best (paper) Books of the Month at 40% Off during the month. 100 MP3 albums @ $5 ea. Prime Music - What and who's included? REFURBISHED units sometimes available. Pricing varies. BUT, maybe it's the cover.
. Why a Kindle at all?
. "Is it worth $260 $189?"
. WiFi? Cellular 3G Wireless?
. Kindle is the real miracle.
. Kindle 6" or DX?
. Anne Rice on the Kindle. While here, try the searchbox at top right if looking for something specific. folder - What is it?
. A Word Macro to organize "My Clippings" file info.
. Using InstaPaper, send documents to Kindle with No size-fee. "3G" Advantages over WiFi: we don't have to find a hotspot, and there are no monthly data charges for the mobile-network access available almost everywhere. Battery: how to keep it stronger? Here are a couple of demos and some background on "Tom." Some wonder what this or that Kindle thing is. This will be a section for them.
. Who/What are on the Amazon screensavers?
. Kindle Social Network (BookSummit) - many writers, friendly, good profile areas. Run by abhi ! The Kindle Chronicles - the Friday Podcast All About the Kindle, by Len Edgerly, with news and interviews each week. A very popular podcast. Hear all previous shows. Kindle Zen - an e-book-industry monitor keeping a watchful eye on trends, with excellent analysis. Follow their news alerts on Twitter. - Bufo Calvin See my report. - Bufo Calfin See my report.
. ALL KINDLES - The Complete 2012 User's Guide to the Amazing Amazon Kindle: Covers all Current Kindles..."
Bruce Grubbs See my report. Kindle Culture by Stephen Peters, whose Kindle Culture blog cartoons and ruminations just delight me. His upbeat perspective, wry observations, and interest in people are all found in this book. A Poet's Progress... by Len Edgerly. See my report. If you find the site helpful and you'd like others to know about it, click here to Stumble it . Thanks!
. Using my K2 to get a DX. You can access your books, periodicals, or the full Web* with Amazon's light 6" Kindle (Global) and the larger Kindle DX, via wireless 24/7 with no hourly charges. * Customers outside the U.S. with wireless are increasingly getting free, slow access to the web and, as a basic feature, can access Wikipedia on the Net 24/7, for free, while reading the Kindle. See the main reasons I've found the Kindle very useful. A popular forum topic (on Amazon) shows that Kindle users are not tied to only Amazon: A Million or so Kindle books - mostly free - how to get them. A Photo Comparison of Kindle 1 and Kindle 2 screens for same material, webpages included. Why does Amazon charge so much for an e-reader?? Is it 'just' an e-reader? Other features. Click for a larger pic of grandpa Kindle 1 webbing at a cafe. Kindlefeeder feeds your Kindle well. No fees required except for auto-scheduled deliveries. You can press Send at the website instead. A Must try. Amazon fees affect some options.
. DX or Kindle 6"?
. 1st Impressions of the DX? For the MOST UP-TO_DATE info on KINDLE READERS AND TABLET models + free Kindle book links and ongoing deals see the special Current Kindles page.